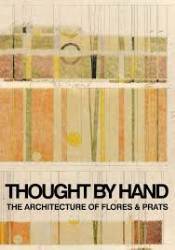 Thought by Hand documents the work of Flores & Prats, an architecture studio founded in 1997 by Ricardo Flores and Eva Parts, that combines working on projects and constructions with a busy academic schedule at various universities. The book reflects the essence of its authors by displaying their design processes that range from sketches and drawings to detailed models of each one of their projects. It compiles works including renovations, social housing, public spaces, neighborhood participation, and university workshops. Texts written by Miquel Adriá, Eva Prats, Ricardo Flores, Juan José Lahuerta, Adriá Goula, Joan Enric Prats, Cesc Segura, Manuel de Solá-Morales, Manuel Arguijo, Carlota Coloma, Adriá Lahuerta, Soraya Smithson, Miralda and Toni Casares.